Sheila’s family had a backyard area which was in dire need of help. Just look at the photo “before”. It was a “weed garden “. 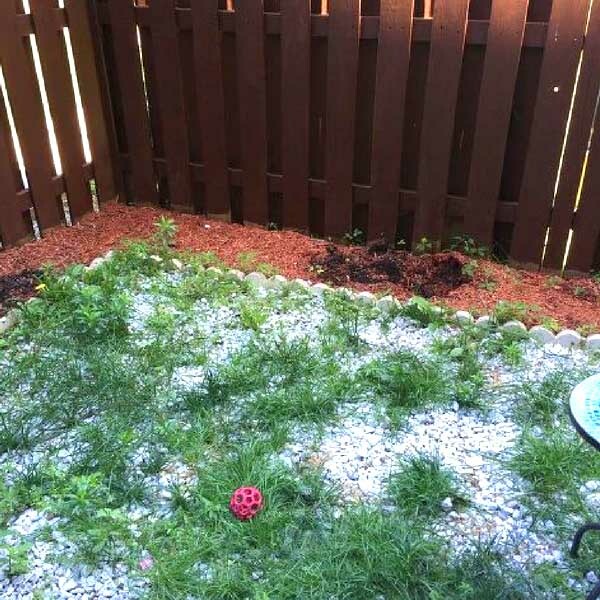 This yard area was just a big mix of mulch, rocks, and weeds. They decided to transform it into a more functional space without the weeds. 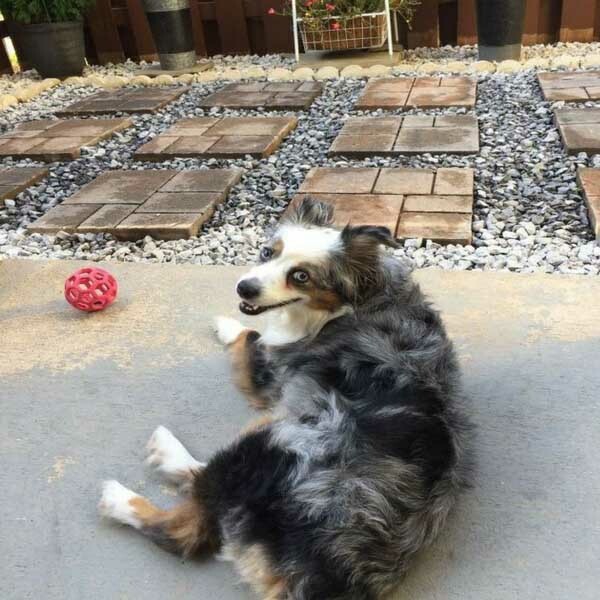 The family wanted to create a beautiful and more usable space with concrete pavers and rocks. So it was time to start the project and get the things going. They started off by pulling out the weeds, began breaking up the soil and transferring as many of the existing rocks over into the border area. The white stones against the fence looked a lot brighter already and they liked it. Then they were going to use this area only as a container garden with pots. 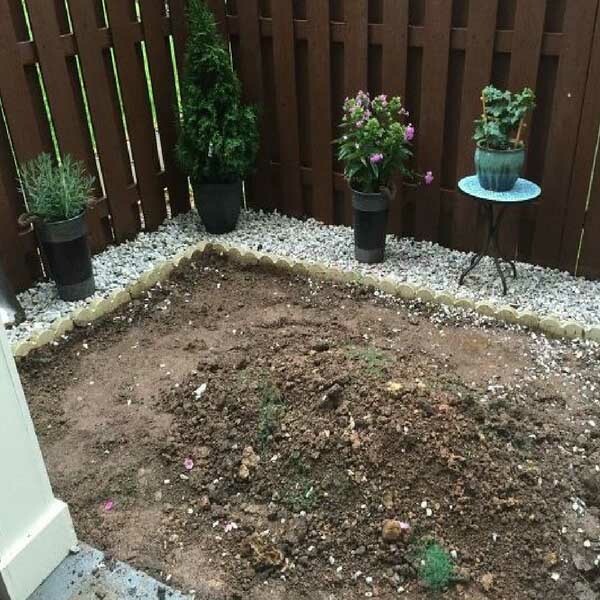 They dug down about 3″ below their existing concrete patio slab and used hand tamper to pack the soil down. Finally they did their best to level out everything. After that they had to prevent weeds grow back. So, they sprayed some preemptive weed killer and laid out a roll of landscape fabric once the ground was nice and level. 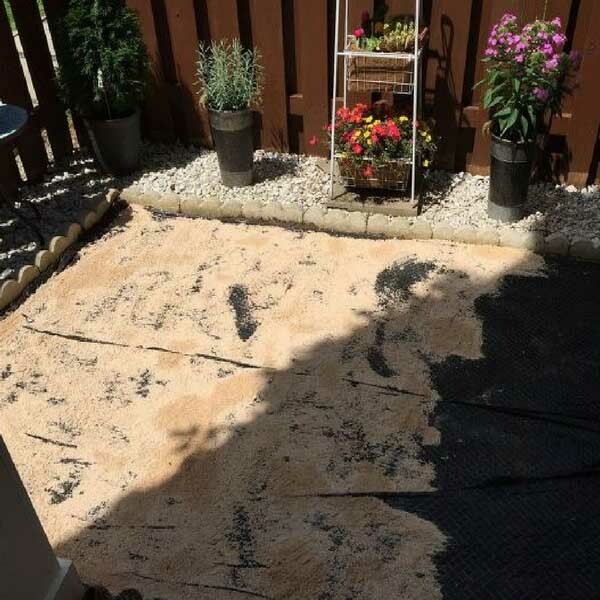 On the next stage of the work they had to put some sand on the top of landscape fabric. 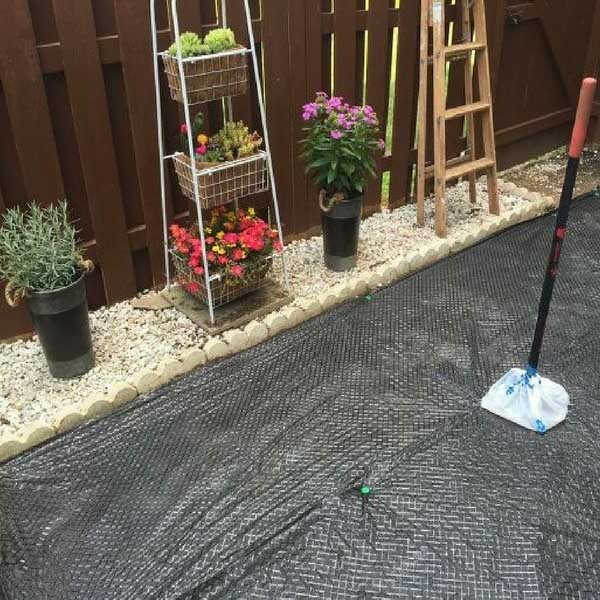 They used 3 bags of paver leveling sand on top of the landscaping fabric to even out any remaining low spots and give the pavers something extra to “grip” on to. 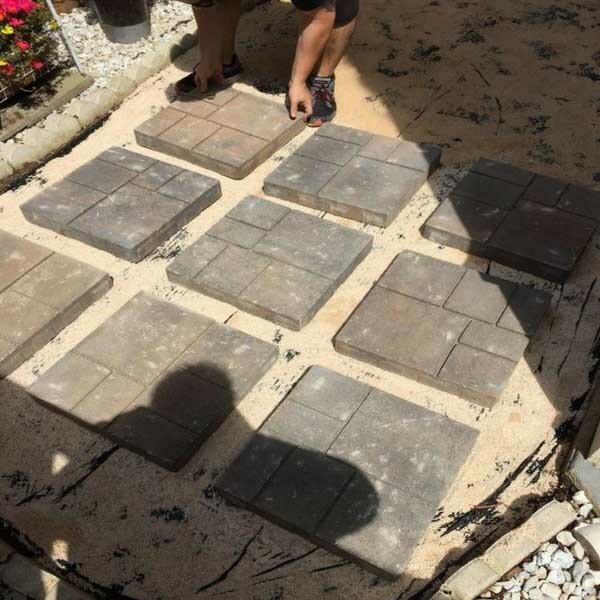 Next step was buying 16″ x 16″ concrete pavers. After that they put them on the ground in a grid pattern (6 rows of 3 pavers). 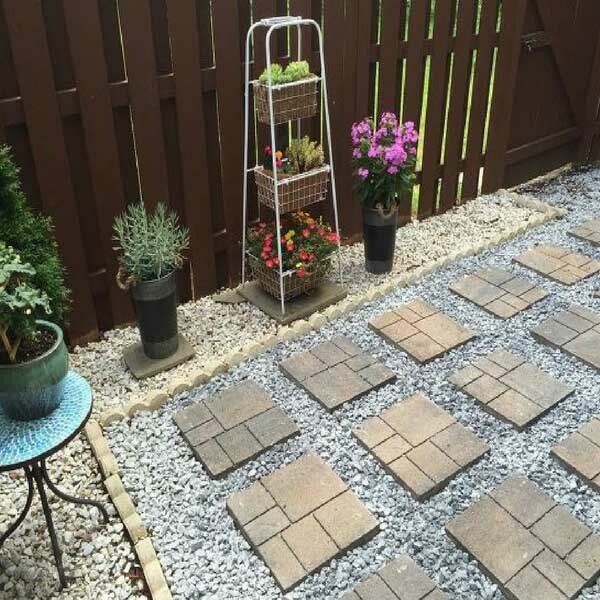 Thereby they covered their 6′ x 12′ space with around 6″ between each paver. Once the pavers were placed, they filled put down a layer of mulch between them all. After that, they poured bags of landscaping rock on top of the mulch, to fill in the gaps between the pavers. Also they sprayed it all down with a little bit of water to help get rid of all of the dust and let the stones start to settle. Once it rains a few times and everything settles a little more, they may have to add a few more bags of stones around the pavers to help keep them in place. Finally the “weed garden” is now a usable space and has really given a whole new look to the patio and backyard! It’s a great transformation project which is not hard to do and is not very expensive. You can find out about each step of the project and also materials, tools and preparation at: Alchemy Home – Sheila has a lot more great DIY projects to try.